Windows and glass conservatory roofs can be expensive to replace or fix, so it is encouraged to keep them in as good condition as possible and the most economical way of ensuring this, is to clean them yourself. Both windows and conservatories roofing systems play a vital role in the overall appearance of the interior and exterior of your home an can be significantly improved when washed. If you are unsure of the best way to clean windows yourself, then we have devised a reliable, sure-fire guide. Best Way To Clean Windows: Why Do it Yourself? It is advised to wash your windows at least twice a year. This is to ensure they maintain their condition and continue to provide a transparent barrier to see out of. You could hire a window cleaner if you do not think you can successfully wash your own windows to the standard you desire, but this is the more expensive and less convenient option. Doing it yourself gives you the freedom to get it done whenever you wish and saves time waiting for a window cleaner to schedule you in. If you feel like you can capably wash your own windows or conservatory roof, then we have assembled all of the information you might need to ensure you complete the job as effectively as possible. Make sure to stock up on the necessity’s to ensure you achieve that professional window-cleaner finish. You need to start by making sure the window ledges are free from cobwebs using the dry brush. Make sure the windows are also clear of any other debris. Then take your bucket, filling it with window cleaning solution or washing-up liquid and warm water. The combination of the soap and warm water will help to break down any grease on the window surfaces effectively. 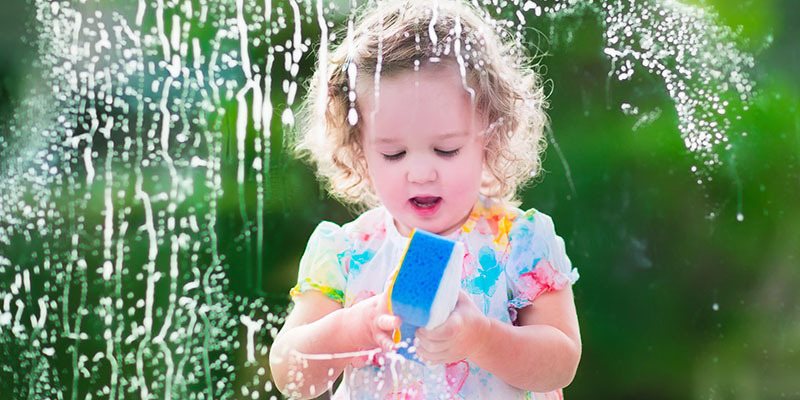 Apply the soapy water solution to the windows using a non-abrasive sponge. Rather than using soap to make up the cleaning solution, you could opt for an organic option; vinegar. Fill an empty spray bottle with one part hot water with one part distilled vinegar. You can then directly spray the solution onto the window panes and polish off using a damp cloth. With this alternative, you have to make sure not to apply it to the windows whilst there is direct sun. For extremely contaminated glass, prewash it with a soapy solution and then use the vinegar spray. You can then remove the excess water using your squeegee. Make sure to periodically wipe the blade on a clean cloth or kitchen paper to prevent dirt build up. Then, working your way up from top to bottom, remove any remaining water with a damp microfibre cloth. If you find that there are leftover streaks on the glass, use a spray bottle to apply more of the solution to the affected areas and wipe off using a clean sponge 30minutes later. Similarly to the window cleaning process, remove any debris that has accumulated at the top of your conservatory roof. The use of low-strength power washer has proved effective for removing all evidence of mould, moss or algae. Do not, however, use the pressure washer on the glass panels or windows as it will shatter them. Investing in a telescopic cleaning brush will eliminate the need for a ladder and will help make the task much simpler. Once all of the debris has been effectively removed, you can start the cleaning process. One methodically from one side of the roof to the other using a warm water soap solution. Make sure to use as much soap as necessary to property eradicate residue and stubborn grime. However, do not be tempted to use abrasive materials on tough stains as this will scratch the exterior. Once you feel you have removed all evidence of dirt and grime, you can rinse it off using a hosepipe and leave to dry naturally. To ensure your conservatory looks good as new, it is essential not to neglect the condition of the framework. Check with your supplier to make sure any products used are safe. It is best to use a simple soap-water solution to avoid damaging the materials with harsh chemicals. If your conservatory is made from timber, then you must also avoid harsh substances and make sure to use a suitable timber treatment. This will help weather the conservatory and ensure it endures the seasonal variations. Cleaning windows yourself will not take longer than an afternoon, obviously depending on the size of your property, and will save you unnecessary window cleaner expenses. Follow our thorough guide for expert advice on how you can achieve that professional finish on your windows. Ensuring this task is completed several times a year will also help to maintain the quality of your windows and save you money long-term. To effectively preserve the condition of your conservatory and its longevity, it is essential to deep clean your conservatory roof as often as possible; typically twice a year. However, if the roof on your conservatory is not salvageable, then Click Glazing supplies and installs conservatories in Milton Keynes. Get in touch today for more details and a free quote. If you have found this article useful in any way, please feel free to share it on your social channels.